Barbara in Tomatoland is an Event Course in Super Mario Maker, released on February 25, 2016. It unlocks the Barbara the Bat Mystery Mushroom costume upon completion. 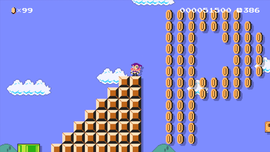 The level begins with a layout similar to World 1-1 from Super Mario Bros., except that Mario must press a P Switch and enter a particular warp pipe. He must then ride some lifts upwards to be led to a series of rooms entered via Warp Doors. Afterwards, Mario must bounce on some big red Cannonballs, go past an area with many sound effects to hit another P Switch, then drop down and hit a Koopa Troopa into a ? Block to release a Super Star, and use it to cross the onslaught of Cannons and reach the next warp pipe. The Checkpoint Flag is immediately afterward, and the rest of the level resembles World 1-1 from Super Mario Bros., with the exception of the ground being replaced with coins, most of the ? Blocks producing P Switches, and some Brick Blocks at the end arranged to form a "P". The Goal Pole immediately follows. This page was last edited on November 15, 2018, at 17:06.